L. A. Norma and I arrived back in New Orleans exactly on time, but on the bus not the train. The Mexicali Earthquake caused Amtrak's Sunset Limited to delay departure from Los Angeles while experts, "walked the line," looking for damages to the roadbed. None were found. But before the train got even close to Lafayette, Louisiana -- where we awaited its arrival -- it was running eight hours behind schedule. We went around the corner and booked passage on the next of five daily Greyhound buses to the Land of Dreamy Dreams, New Orleans. "Our magic carpet made of woe leaves in less than an hour," L. A. Norma said, puffing on a fresh Camel and dispatching us up Lee Street to Don's Downtown, The Original Cajun Restaurant, for gumbo to go. "Best gumbo around, but a word to the wise," she added through a blast of cigarette smoke, "tell them not to plop a big scoop of potato salad in your gumbo." Potato salad in gumbo is a culinary oddity found in the Land of Boudin. Usually, New Orleanians do not like it. Poste des Opelousas, then Church Landing, then . . .
We were returning from the Catfish Festival in Washington, Louisiana. Formerly Festival du Courtableau (first land grant in the area was to Jacques Courtableau), their annual Spring festival is held in a Creole village established in 1720, when Louisiana was a young French colony. At that time the French-Canadian Diaspora had not occurred and George Washington was not yet born. So why the name? Why it is today named Washington, a name jarringly not French, was not explainable by anyone we talked to, but we suspect it had to do with pro-Union politics. An interesting, often forgotten fact of Louisiana history is that not all supported the Confederacy. The first president of what grew up to be Louisiana State University, for example, returned North and became Abraham Lincoln's ferocious General William Tecumseh Sherman. L. S. U. 's antecedent was established by the state legislature in 1853. It was located above Washington, at the present day site of Pineville and was named Louisiana State Seminary of Learning and Military Academy. Sherman was its first president. It moved to Baton Rouge in 1925. So what's in a name, Jacques Courtableau got his replaced with a catfish! The catfish we had were fried, salty, and heart-stoppingly good, but the smoked giant pork chops at another stand could have inspired a religion. It also snowed! Not much. Just a few tiny pellets of soft sleet that could only pass for snow in a state where snowballs get mistaken for snowmen. "If you don't look up you will miss it," Norma said, undulating across the outdoor dance floor, lost in the embrace of Zydeco. "Music better'n the day God first made Zyd," she added, grinning and smoking. We saw the soft snow/sleet evaporating as it fell through the air. "A hard Winter's last gasp," we said, heading for the caramel popcorn table. We had not been on a Greyhound bus since the first heady days after Hurricanes Katrina and Rita, when we decamped to Lafayette to await the receding waters in New Orleans. In those days, if Amtrickle trickled in more than two hours late we caught the bus. Then Bush was running America's trains, and you bought your ticket and took your chances. No one could tell you when the train would arrive, even when you stood cell-phone in hand in front of the arriving train. Now, praise good government, the trains are running on time. Except this day! "Its Global Warming," Norma said. During our evacuation, the bus between Lafayette and New Orleans buzzed with post Hurricane news, faith, hope, fear. Everyone talked about houses lost. Lives lost. And personal pot holes on the Road Home. One bus driver told us he lost his home in New Orleans East, but thought he could rebuild it. He always began each trip announcing on the public address system: "There will be no smoking on this bus. That means no cigarettes, no cigars, no Maryanna, and no crack cocaine." And there never was, to the best of my knowledge. But a pint of liqueur commonly poked its charming neck up from passing hip pockets. On one trip, a very black man with very gold teeth and earrings said, "No Road Home for me." He was living, "Back in Opelousas," where he grew up. He told us, "The Ville Platte Smoke Meat Festival is the best eatin' festival around." Years later, in front of the University Medical Center (formerly Charity Hospital), we saw him again. He said, "That Road Home money done come through for me after all. I'm back in New Orleans." "Great news," we said. We also told him about the smoked pork chop at the Washington Catfish Festival. And how "The Ville Platte Smoke Meat Festival, indeed, turned out to be the best eatin' festival we ever ate at." He laughed and said, "How lucky we are." Fellows of the American Institute of Certified Planners celebrate the unveiling of Marigny's Great Places plaque. Photo (from left): New Orleans Councilmember Arnie Fielkow; Eugene D. Cizek (Faubourg Marigny Improvement Association's First President); F. M. I. A. President Chris Costello; American Planners Association President Bruce Knight, Fellow of the American Institute of Certified Planners; and A. P. A. Louisiana Chapter President Stephen Villavaso, F. A. I. C. P., celebrate the unveiling of Marigny's Great Places plaque, in Washington Square Park. A black-and-white United Cab dropped us at the rue Royal and Frenchmen Street gates to Washington (that name again) Square Park for the ceremonial unveiling of the American Planners Association plaque recognizing Faubourg Marigny as a "Great Place in America." The A. P. A. was holding its convention at the Ernest N. Morial Convention Center. 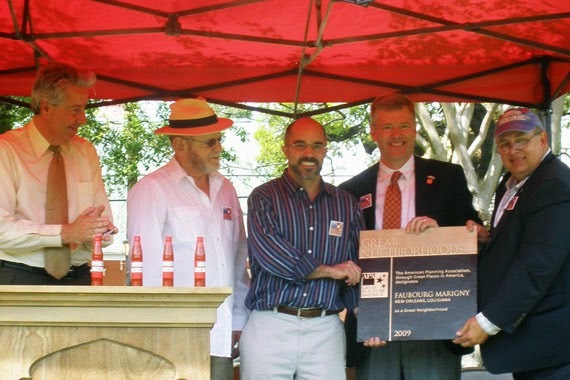 The plaque recognises Faubourg Marigny's "Strong civic engagement, successful preservation efforts, and recent revitalization of Marigny as an arts and entertainment destination." The A. P. A. also sponsored something titled the Dutch Dialogues, which brought together Dutch and American experts on water management. Their topics of discussion were the drainage canals from the Lakefront to the French Quarter; the area in and around Bayou St. John; and new uses for City Park and the neighborhoods and environments between London Avenue and the Orleans drainage canals. Hope. The jury is still out on much of this. Jazz Fest is going on out at the racetrack, and the lovely Confederate jasmine is in bloom all over Town. This year its spicy sweet smell is tainted with oil fumes from a growing glob larger than Cuba sloshing about and onto our protective marshlands, and America's seafood estuary. Eat up before . . .
"We smile because we are lucky," the black man with the gold said. Life in Louisiana is a dapple-lighted Monet painting set to a Bobby Charles soundtrack. We smile because we are free. And because June 25-26 will bring another Smoke Meat Festival in Ville Platte, and another reason to ride The Sunset Limited. "Life is short," Norma says, "If you can't dance on the edge of your grave when can you?"